In the Cortana "Ask me anything" field, type settings and hit Enter. 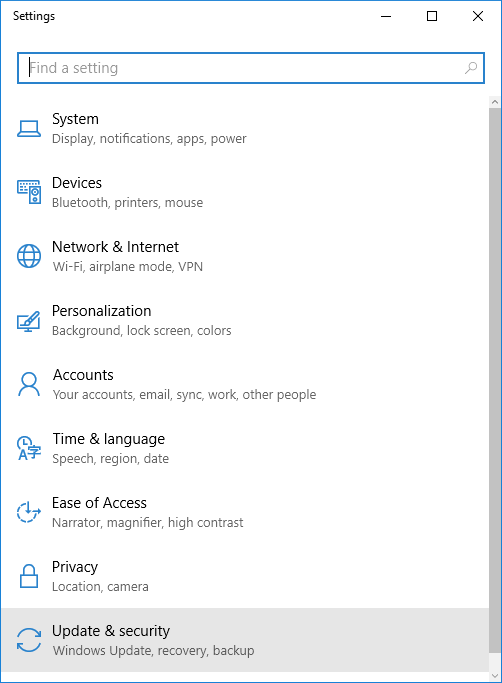 The best match should be "Settings" which is listed as a "Trusted Windows Store app" and has a gear icon to represent it. Click on it. 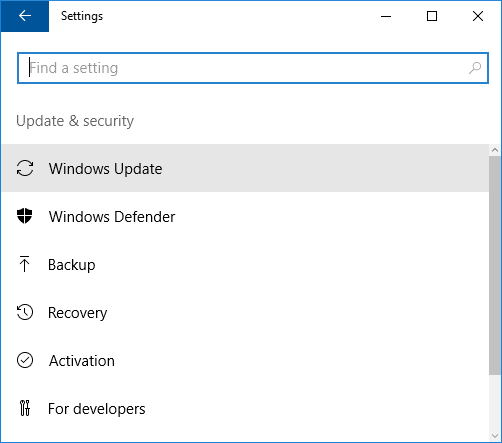 Click on Update & security in the Settings window. 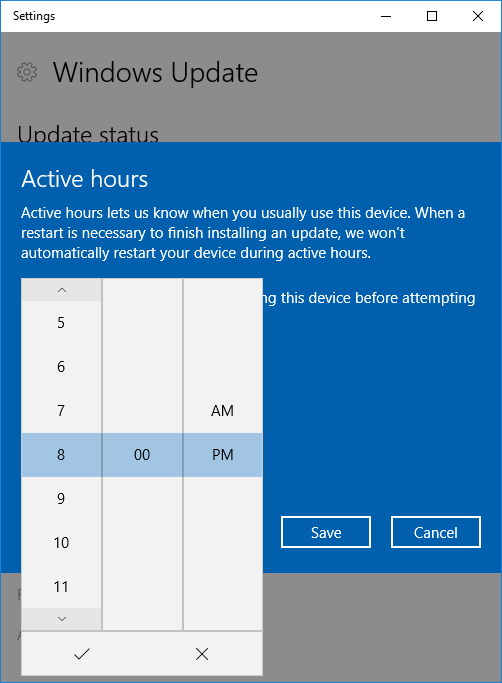 Now that you are at the Settings window for Windows Update, you will see the hours the operating system believes are your active hours. 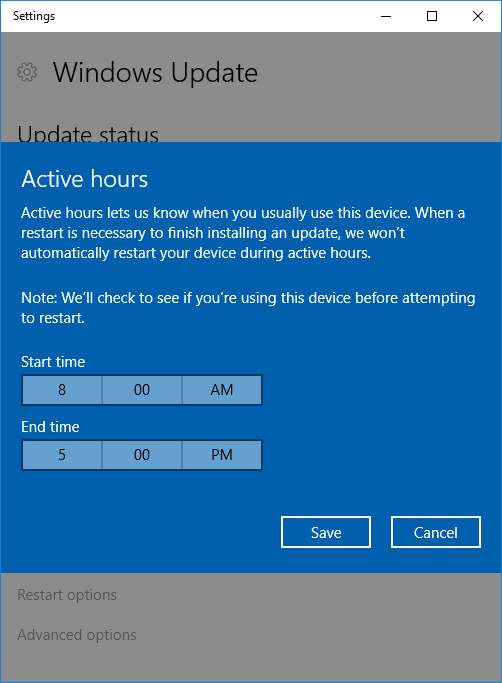 E.g., in the screen shot from a Microsoft Windows 10 system that appears below, "Your device is scheduled to restart outside of active hours. (Active hours are 8:00 AM to 5:00 PM.)" After selecting a new hour, you must click on the check mark at the bottom of the hours display to change the time. Then click on Save. You will then see the new active hours displayed. You will not be able to set the active hours period to be more than 12 hours. 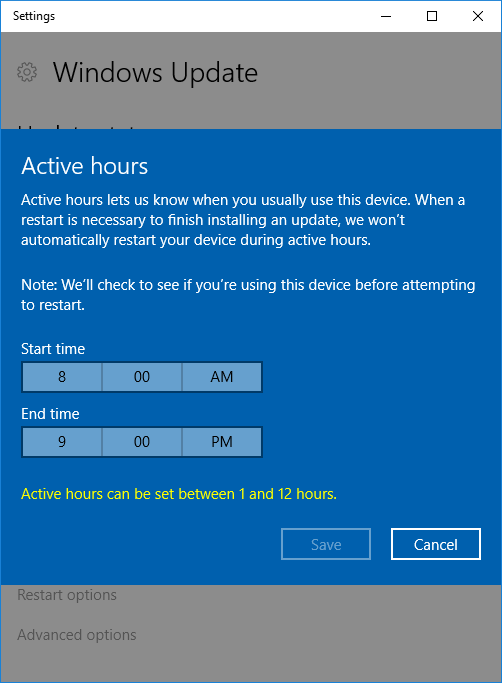 E.g., if I try to set the end time to 9:00 PM, I will see the message "Active hours can be set between 1 and 12 hours" after clicking on the check mark. The Save option will be grayed out and the only option available is Cancel. Another option available to you is to click on Restart options. 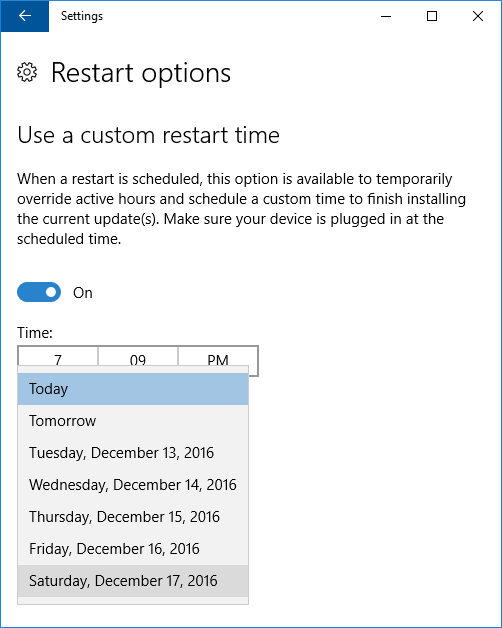 You can use that option to push the date of the automatic reboot further into the future. Click on the button next to Off to turn the setting to On. You can then click on "Today" in the Day field which will produce a drop down list of days you can select for the reboot. 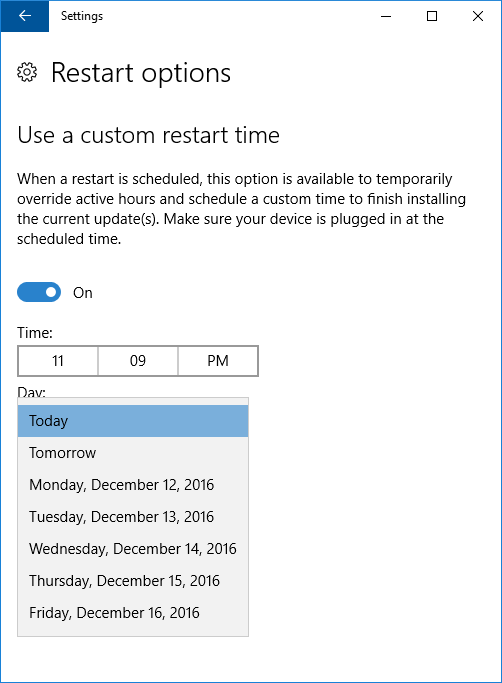 In the example below, I can change the setting from "Today" (the screen shot was taken on Saturday December 11, 2016) to "Tomorrow" or 5 following days. I.e., there is a choice of 7 days from today onwards. 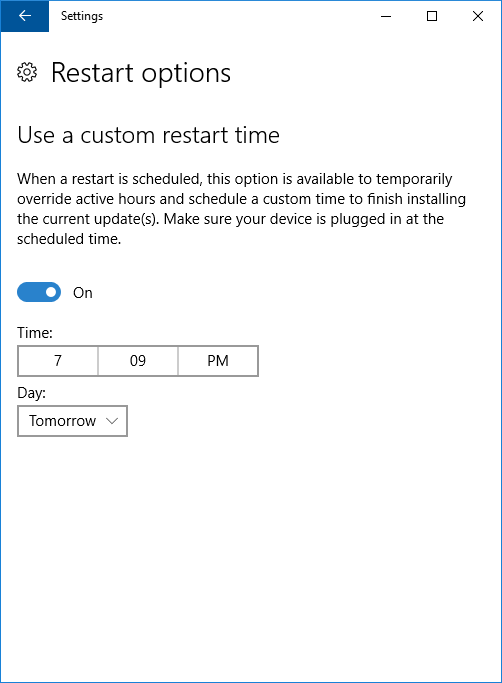 In the example below, I changed the restart time to tomorrow and changed the time to 7:09 PM. 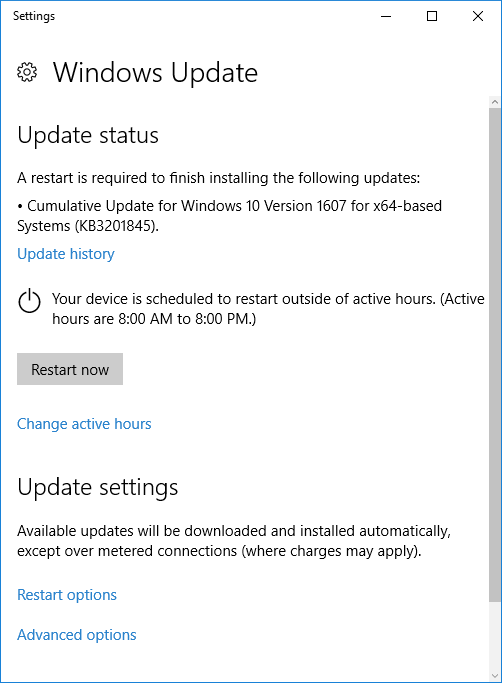 If I then click on the left pointing arrow at the upper, left-hand corner of the window, I see the update status display reflecting the new time. I could then close the Settings window. 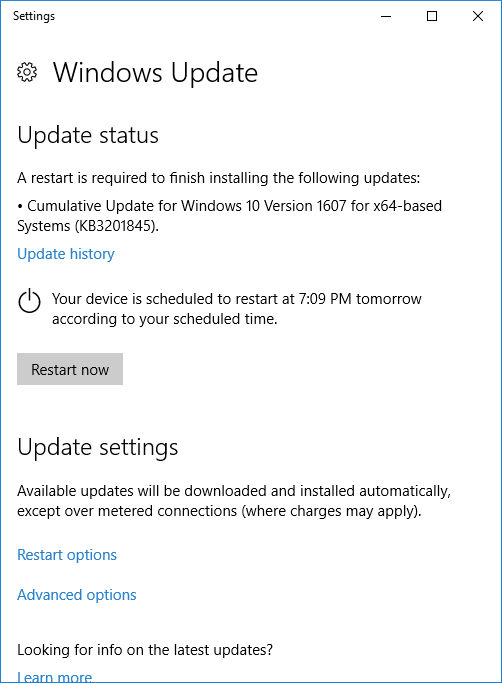 If, when the day comes that the system is scheduled to reboot, I decide that I don't want the system to actually reboot on that day, I can go through the same process and move the restart date further into the future again. 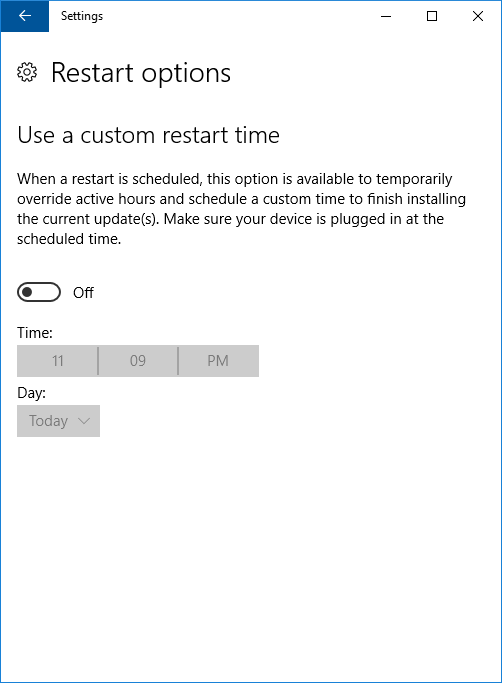 E.g., if on Sunday, December 11, I decided that I don't want the system to reboot at 7:09 PM on that date, the time I had selected the day before for the reboot, I can choose the custom restart option again and now I can move the restart date out to the following Saturday, December 17, whereas the day before the last day I could pick was Friday, December 16. In such a manner I can keep moving the restart date further into the future, provided, of course, I remember to do so.